Posted on April 13, 2019 Posted in Cakes	. Ok so the flavor pairings for this cake is not ground breaking. Raspberry, apple and vanilla has no real ‘wow interesting twist factor’. 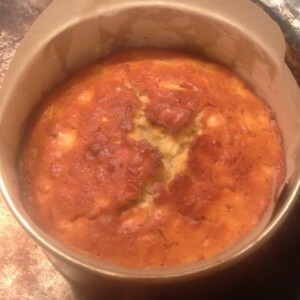 How this cake made it to my website….? Due to it being absolutely delectably delicious, as well as the unusual way the cake is constructed. 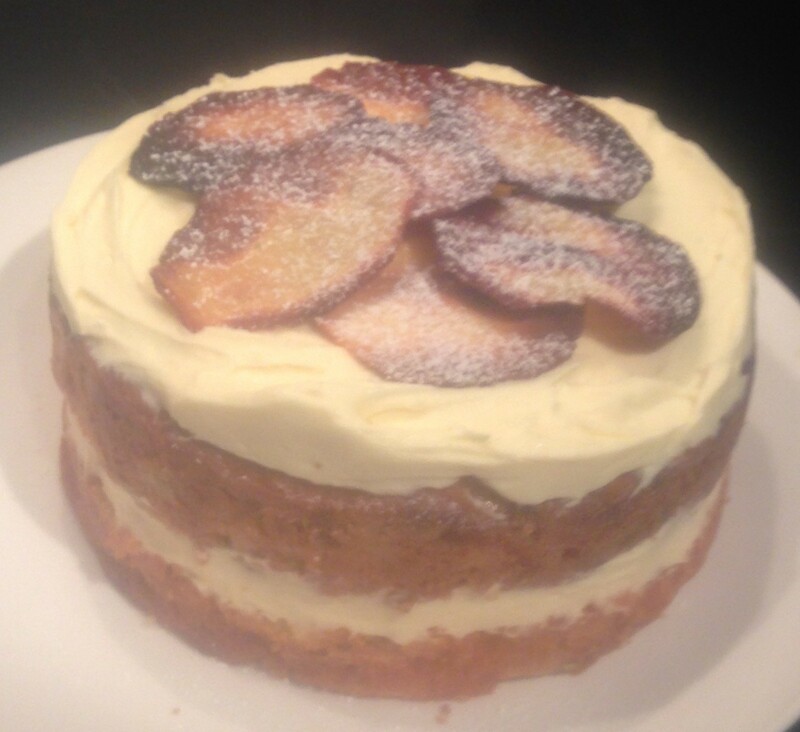 The main feature of this cake is not the flavor pairings but the layers of batter and apple that structure the cake. 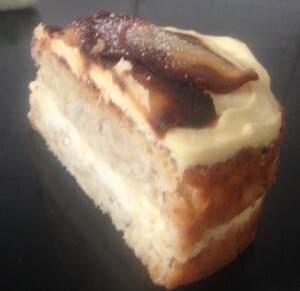 Every bite has an ever-so-tasty yoghurt based cake with the twist of sliced apple layered texture. 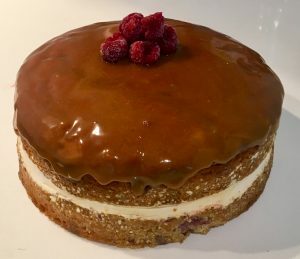 This cake is a must with a cup of tea, in fact I dare you to find another cake that satisfies your cake craving more when paired with a cup of tea at 3pm! 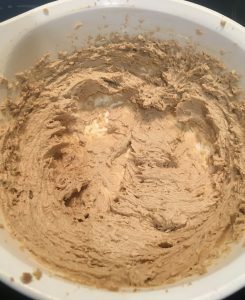 Place the butter and sugar into a bowl and using electric beaters whisk the mix for 3 minutes until light and fluffy. 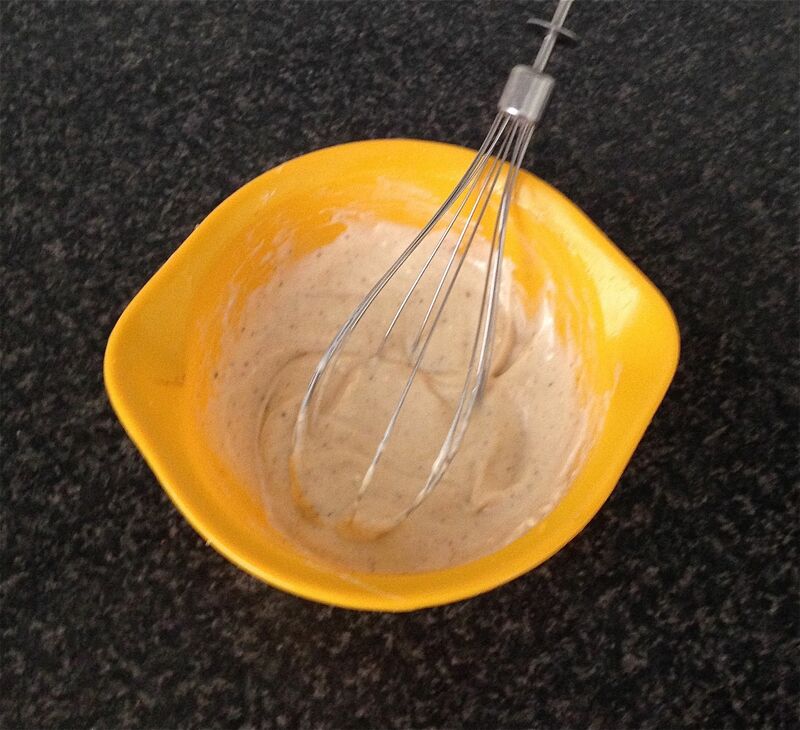 Add the vanilla essence and whisk until combine. Add the eggs, one at a time beating, in between each addition. Add the yoghurt and beat until combine. 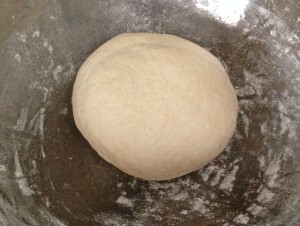 Add the flour and beat on low until just combine. 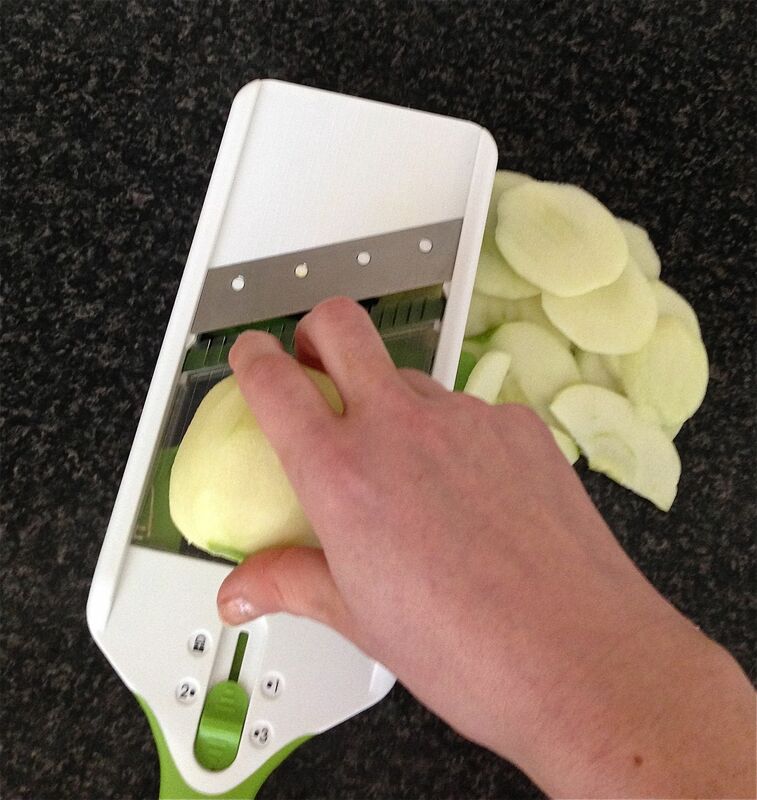 Peel the apples with a fruit peeler. Using a hand slicer mandolin cut the apple into thin slices. Add the raspberries to the mix and carefully stir through. 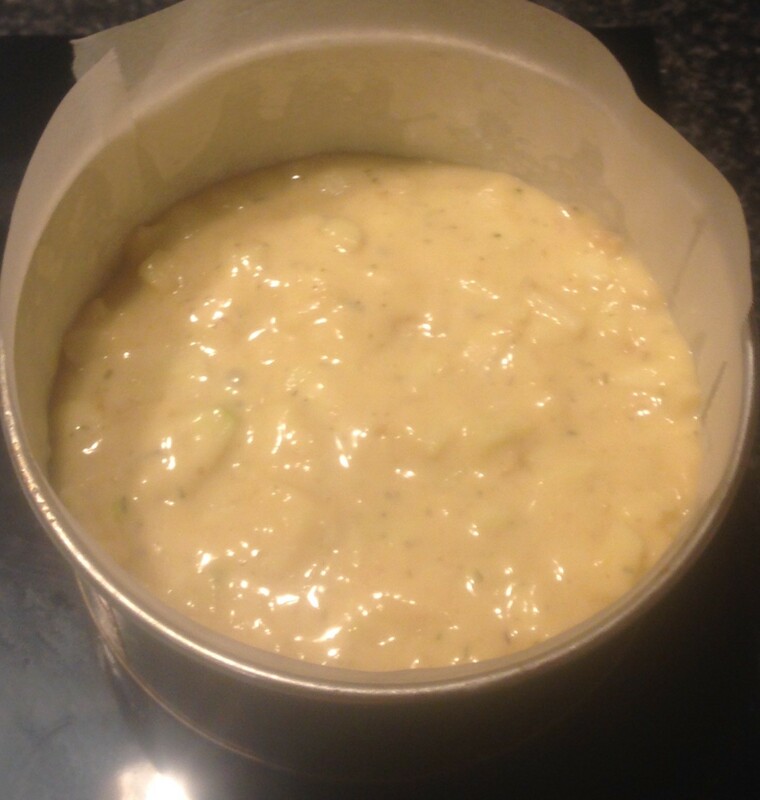 Add half the cake batter into the tin and flatten the top with a spoon. Add half the apple slices in a fan pattern. Add the remaining batter and flatten the top with the back of the spoon. Add the remaining apple slices in a fan pattern. Sprinkle the extra 1tbsn sugar over the apple slices. Bake in the oven for 1 hour or until a skewer inserted into the center comes out clean. Place the cake onto a cake rack to cool completely. 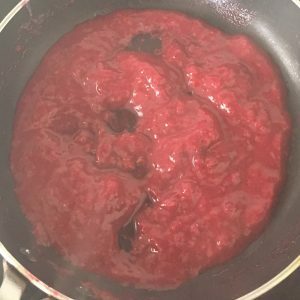 Meanwhile to make the raspberry sauce, place the raspberries into a saucepan with the condensed milk. On a high heat stir until the raspberries have disintegrated. Pour the sauce through a sieve to remove the seeds. Pour the sauce over the cake. Pour the thickened cream over the cake and enjoy! 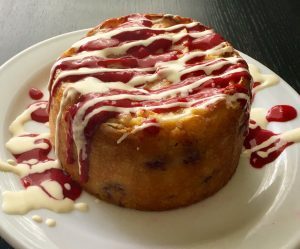 Tags: apple, raspberry, Raspberry Layered Apple Yoghurt Cake, yoghurt	. Posted on February 24, 2019 Posted in Cakes	. After recently enjoying a thirst quenching cider while out at the pub one Friday sunny lunch it got me thinking of baking a cake with cider as the key ingredient. This particular cider was a raspberry flavor but I wanted to trial a few flavor combos, focusing on traditional cider flavors as well as the raspberry one I was enjoying. 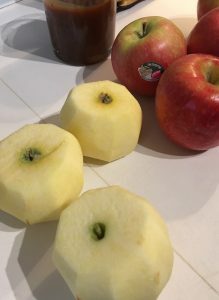 The experimenting in the kitchen included raspberry cider, pear cider and apple cider, in which I played around with grated apples, grated pears and raspberries as complementary ingredients to the alcohol. After around 7 different cake variations I ended up completely satisfied with the long-shot winner of apple cider, raspberries, apples and caramel chew candy. The candy being a bit of a last minute addition to this recipe, in which was added to gave the extra unusual twist I was looking for, unsurprisingly working hand-in-hand with the apple it also worked with the raspberry. 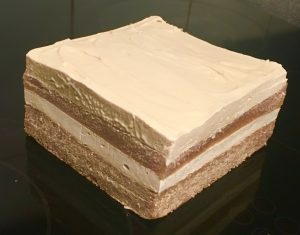 A delicious almost pudding like cake, one bite and you will be going back for a second piece…or if you are like me a third! Pre-heat the oven to 170c degrees and line a 30cm cake tin with baking paper. Whisk the butter and sugar with electric beaters for 5 minutes or until pale and fluffy. Grate the apple and add to the egg mix. 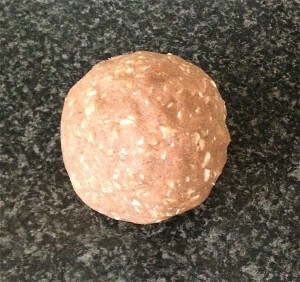 Dice the caramel chews into small pieces, add to the egg mix and stir until combine. Pour the cider into the egg mix. 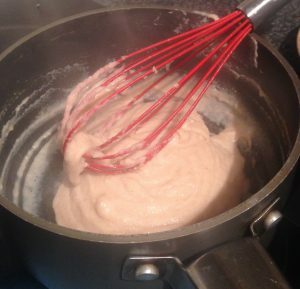 Sieve the flour and baking soda into the egg mix and whisk on low with electric beaters for 30 seconds or until just combine. Add the raspberries and fold through the mix until just evenly combine. 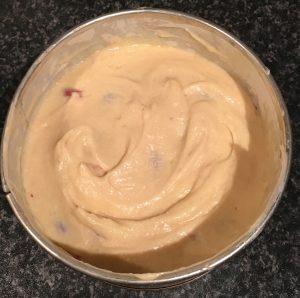 Pour the mix into the cake tin and bake for 1 hour or until a skewer inserted into the center of the cake comes out clean. 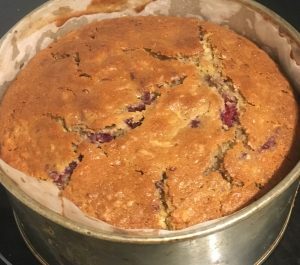 Allow the cake to cool in the tin for 5 minutes before inverting onto a cooling rack until cold. 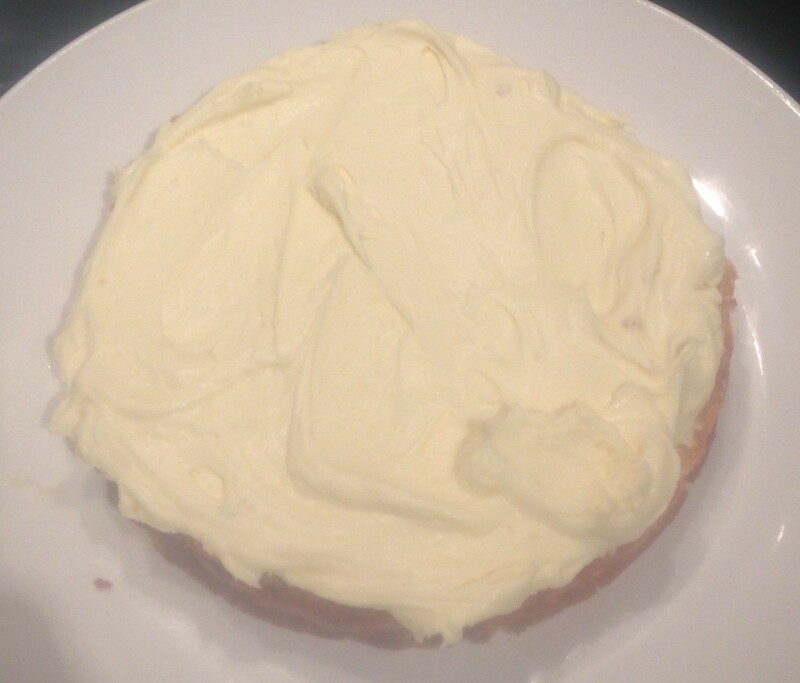 Meanwhile make the icing by placing the 200ml of cider into a saucepan on a medium heat until reduced down to 80ml. Add the 100g of caramel chews and whisk with a hand whisk off the heat until smooth and glossy. 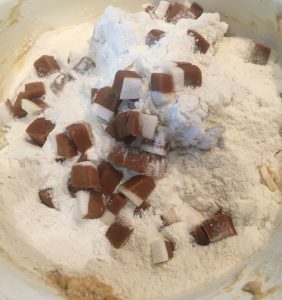 Once the caramel mix has cool to room temperature whisk 100g of the caramel mix with the 90g butter with electric beaters until light and fluffy. 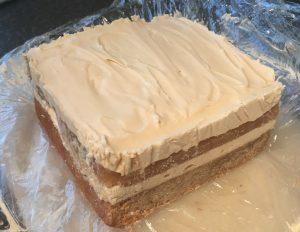 Cut the cake in half horizontally, spread the caramel icing onto the top of the bottom cake layer, top with the second layer. 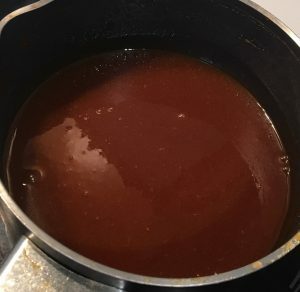 Place the remaining caramel back on the saucepan until just lukewarm and pour over the top of the cake. Tags: apple, Apple Raspberry Cider Caramel Candy Cake, caramel, caramel candy, cider, raspberry	. Posted on October 27, 2018 Posted in Doughnuts	. 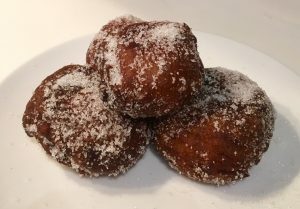 There are so many doughnut recipes in the world that vary in base ingredients as well as methods, shapes, sizes, flavours and filling types (if any). 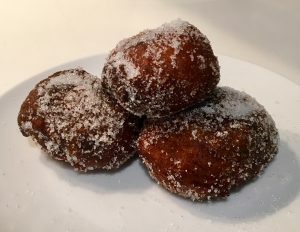 On top of this many counties have their own traditional doughnuts; the Dutch with (oliebollen), Mexico (churros), Middle East (awwami), France (beignet) and the list could go on and on. 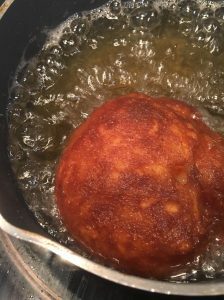 Then there is the use of different core ingredients such as flour, potato, semolina, apple, ricotta, rice, cream cheese, milk powder just to name a few. 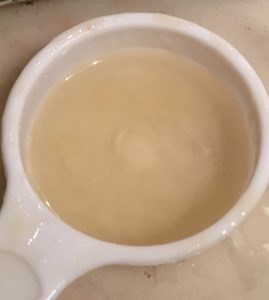 Then there is yeast or no yeast, dry or soaked, iced or filled, round or ring shaped….there must be thousands of varies all special to someone in the world. As this is such an interesting sweet treat I decided to have a day of experimenting with traditional and new age (injection filled doughnuts), different key ingredients for ultimate fluffiness and interesting flavour combos to stay true to my passion of unusual but amazing tasting flavour pairings. 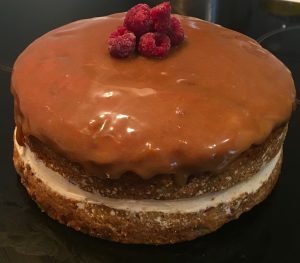 It will take me a long long long time to list all the experiments, suffice to say this recipe I’m posting is fluffier than a pancake and delicious in taste – you won’t stop at one! Though you do need to be an aniseed/star anise/fennel/licorice fan as I heavily feature aniseed for something delicious and different. Warm the milk to a luke warm temperature. Add 15g sugar and the yeast to the milk and stir. Set mix aside in a warm place for 10 minutes to bubble and activate. Meanwhile, peel the apple and grate it (a 130g apple will produce 110g grated apple), place into a bowl. Add the flours in a bowl along with the ground aniseed, aniseed essence, salt, butter, eggs and 1 small lemons zest. Place the flour mix bowl into an electric mixer with a paddle attachment and beat on medium until well combined. Next pour the milk into the flour mix slowly in a stream, beating for 5 minutes. Cover the bowl with plastic wrap and set aside somewhere warm for 90 minutes to rise. Place paper towel sheets onto a large plate for later use. Place the 100g extra sugar into a shallow bowl. 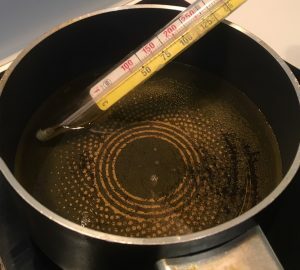 Pour the oil into a saucepan and heat on medium on a stove top until 175c degrees is hit. Oil 2 tbsn’s (to stop the batter sticking to the spoon) and spoon a large tbsn of batter into the frying oil, using the other spoon to scoop the mix into the saucepan. 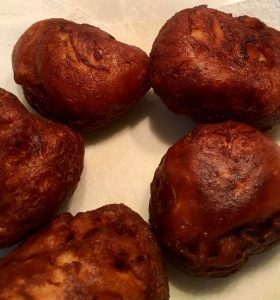 Cook the doughnuts for 3-4 minutes until golden brown and crispy on the outside. Using tongs remove the doughnuts from the oil and place on the paper towel to absorb excess oil. Following, using a pastry brush add the ouzo to a doughnuts on both sides. Place the doughnuts into the sugar, ensuring even coating. Repeat ouzo and sugar steps until all doughnuts are done. Place doughnuts on a plate and enjoy! PN: If you don’t have aniseed essence you can replace with an extra tbsn of ground aniseed. Ouzo can be replaced with Black Sambuca or any other aniseed/licorice flavoured liquor. Tags: aniseed, apple, Apple Aniseed and Lemon Doughnuts, doughnuts, lemon, ouzo	. Posted on October 6, 2018 Posted in Tarts	. The idea for this recipe was all around combining the sweet, the salty, the sour and savoury. 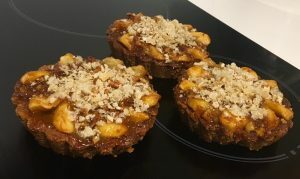 As I had a bunch of apple left from a previous baking session I decided to use them up and have apples as a core sweet component of a dessert. 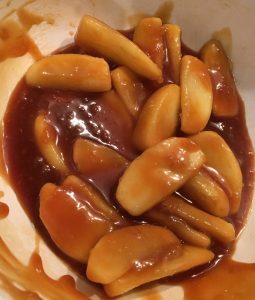 I thought that if I made a salted caramel, in which would go brilliantly with the apple I could get some saltiness as well as the sweet. I’m also mindful that these 2 ingredients would make for a prefect tart filling. So, if I was to make a tart then I needed a base. 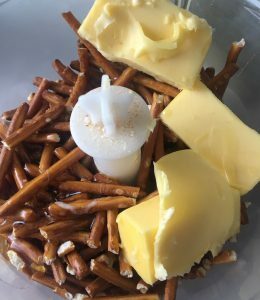 I figured since pretzels are basically flour and salt I could use these savory snacks as a base to my recipe, ticking the savory and salty box. To not only ramp up the savory but also ensure some crunchy texture I opted for a few extra ingredients that also complement the apple flavour. 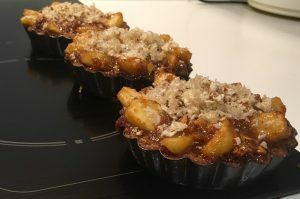 After playing around with a few ingredients I decided that walnuts and pork crackle, when combine with the apple were too good of a combo to ignore. Lastly, as I did want to have sour in the recipe in some way the only way this would work and add an extra depth to the flavour was through some lemon zest. A lot of trial and error was had for this recipe, but in the end I’m impressed with the result. 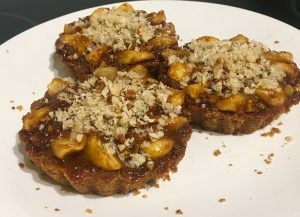 I successfully ticked the sweet, sour, salty and savory boxes as well as the tarts achieving deliciousness with a diverse range of textures, from crunchy, smooth and soft. Pre-heat the oven to 175c degrees and grease 6 small tart pans with oil spray. 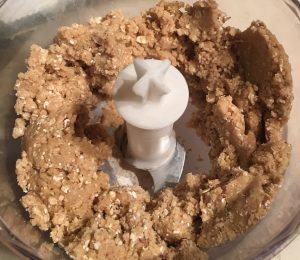 Process the pretzels, butter and honey in a food processor until the mix resembles breadcrumb texture. Spoon 50g of filling into each tart case and pat the bottom and sides of the tart case with oiled fingertips until the whole tart case is covered with the mix. Place the tart cases on a tray, poke with a fork in the centre lightly and bake in the oven for 8 minutes or until golden, set aside to cool. 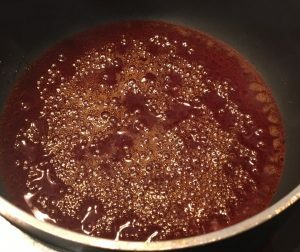 Make the caramel by placing the sugar into a pan on high heat until the mix turns amber and bubbles. Remove off the heat, pour in the cream, add the salt and the butter. Stir until well combine and silky smooth in texture. 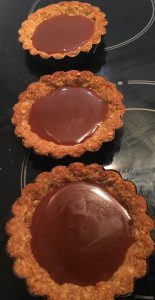 Allow the caramel to sit for 10 minutes to cool then place half the caramel into a bowl and for the remaining pour into the bottom of the cooked tart cases. Peel the apples and core them. Cut the apples into quarters, then each quarter into 3 pieces lengthways. 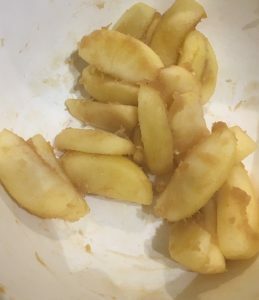 Put the apple pieces in a bowl with a pitch of salt, the brown sugar, the lemon zest and flour. Stir until the apple is well coated and the mix is evenly distributed. Place the bowl in the microwave on a medium heat, stopping and mixing in 60 second bursts until the apple is soft and the flour mix coats the apple well. 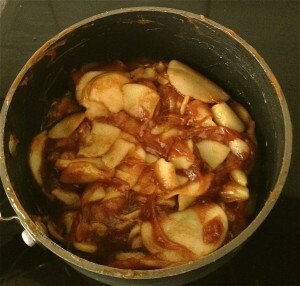 Add the remaining caramel to the apples and stir until well combine. 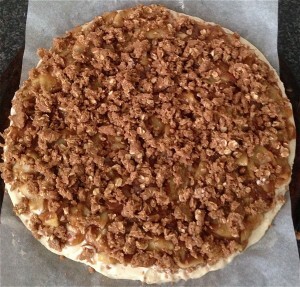 Place 40g walnuts and 30g of the pork crackle into the apple mix and stir until well combined. 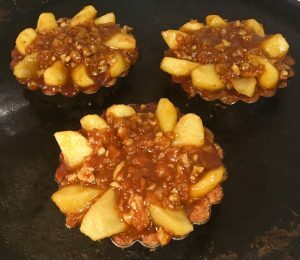 Spoon the apple pieces over the caramel in a fan design, topping with the remaining caramel mix over the apples. 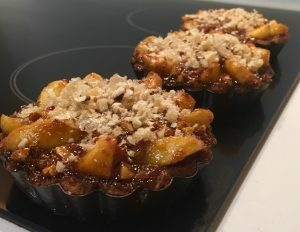 Place tarts on a tray and bake in the oven on 175c degrees, for 20 minutes. Remove from the oven and top with remaining 10g walnuts and 10g pork crackle, leave aside until they have cooled to just warmer than room temperature. 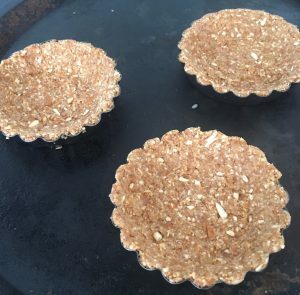 Remove the tarts out of the tart casings and enjoy as is or with a scoop of vanilla ice-cream on the top. Note: You are best using actual pork crackle, not using the pork belly crackling with the fat. We just want to the crunchiness of the crackling! 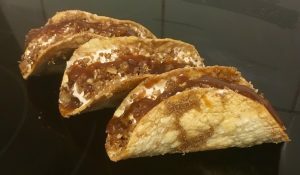 Tags: apple, caramel, lemon, pork crackle, pretzel, Pretzel Based Caramel Apple Walnut and Pork Crackle Tart, Pretzel-base Caramel Apple Walnut and Pork Crackle Tart, walnut	. Posted on August 26, 2017 Posted in Unique	. It may seem like there are endless components to this dessert don’t be scared. There is a reason the recipe only has 21 steps. Most of the steps take minimal effort and time to complete (the cream takes a whole of 1 minute). Additionally, the recipe uses the same few ingredients over and over thus making is a straight forward and simple bake to get right. This recipe did go through a few adjustments along the way, however my persistence in keeping with the core idea was well worth the effort. This recipe is truly tasty and a prime example of turning the savory into sweet. Pre-heat the oven to 180c degrees and line a baking tray with baking paper. 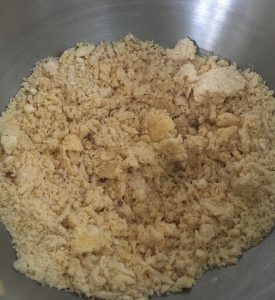 Place all the crumble ingredients into a bowl and using your fingertips rub butter into mixture until it resembles breadcrumbs. Sprinkle the crumble over the prepared tray and bake for 15 minutes or until golden brown in colour. 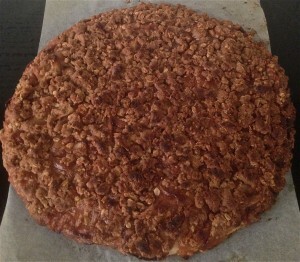 Place the tray aside to cool completely then break up the crumble into breadcrumb consistency with fingertips. 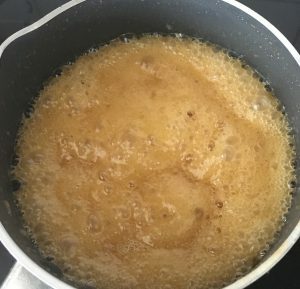 To make the caramel place the white sugar and water into a saucepan on a high heat and stir until the sugar has dissolved. 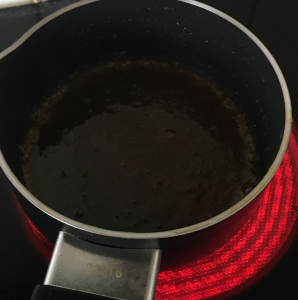 Leave the mix without stirring until the sugar syrup is dark golden in colour, take off heat. 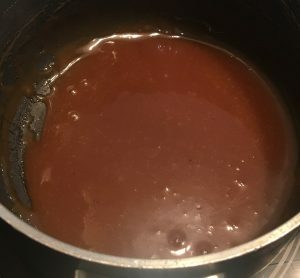 Add the brown sugar and cream and mix with a metal spoon until the caramel is smooth and glossy, leave aside to cool completely. To make the cream place the ingredients into a bowl and using electric beaters whisk until peaks form. Place in the fridge for later use. Next are the taco shells. 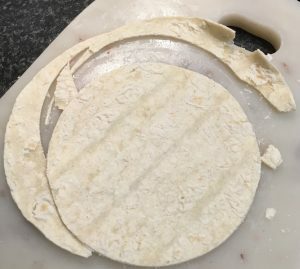 Using a 10cm circle cookie cutter cut out 1 circle per tortilla wrap. 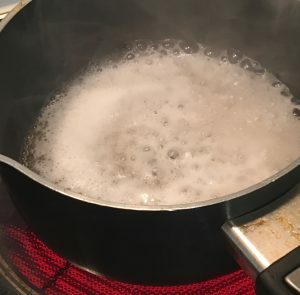 Place wraps in the microwave for 10 seconds or until they just start to steam. Melt the butter and using a pastry brush evenly brush the butter onto both sides of the 8 x 10cm wraps. 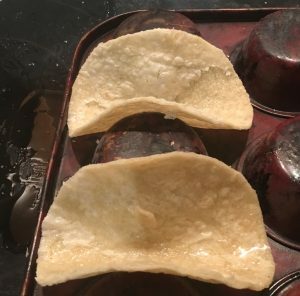 Turn a cupcake tin upside down and place the shells in the dips to make the taco shell shape when the wraps bake. Place the tin in the oven for 15 minutes or until the shells start to go golden brown. 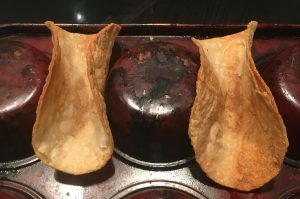 Be sure not to let the shells cave in on the sides (if this happens remove the shell from the oven and place a knife width-way in the middle of the 2 shell sides while hot and it will reshape). 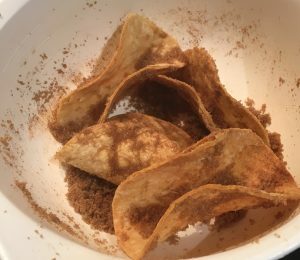 Place the remaining 30g brown sugar and 1/2 tsn cinnamon onto a bowl, stir then with the warm cooked taco shells place in the bowl and cover completely with the cinnamon sugar mix (just like a churro or cinnamon doughnut). Leave aside to cool. 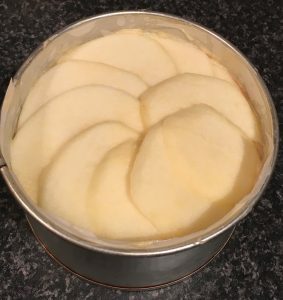 Lastly make the apple filling by placing the apple pieces, sugar, butter, cinnamon, 30ml water and lemon juice into a saucepan on a medium heat, stirring until well combine and the apples start to soften. 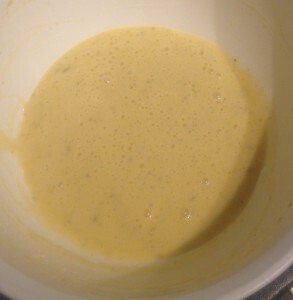 With the remaining 40ml of water add the corn flour and stir until smooth. 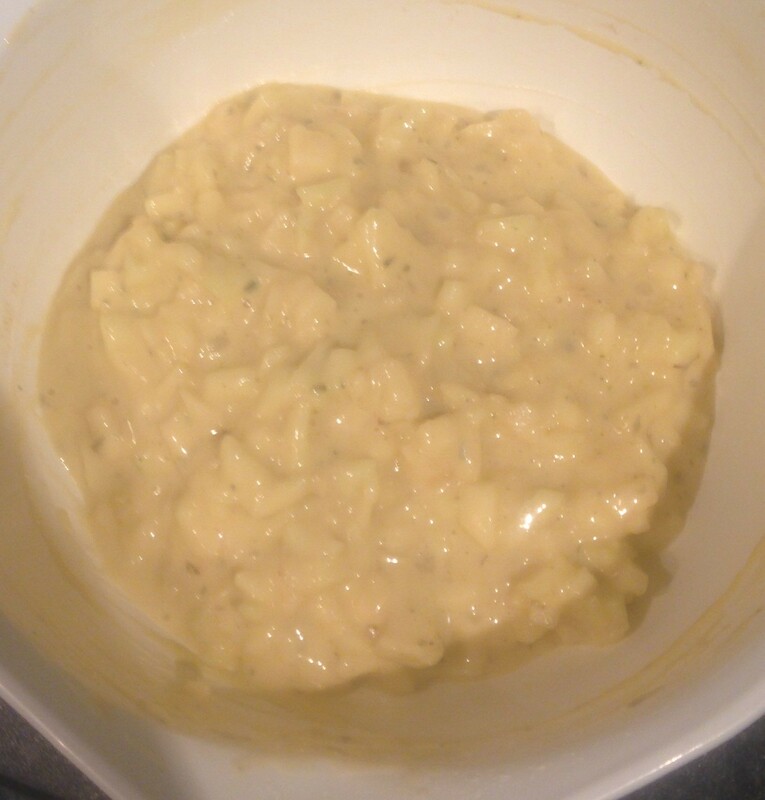 Pour the corn flour mix into the pan and stir until the mix thickens slightly and the apples are cooked. Set the apple mix aside to cool completely. 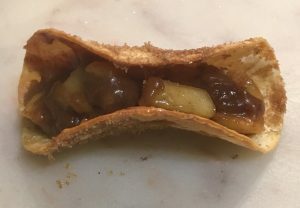 To assemble, grab a taco shell and spoon 25g of the apple filling into the bottom of the shell case. Top the apple filling with 10g of the cream mix. 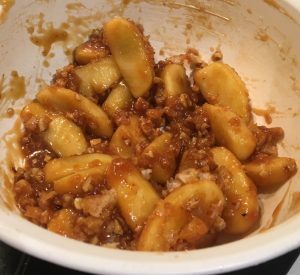 Add a good sprinkle of the crumble mix and finish off with a solid drizzle of the caramel sauce. 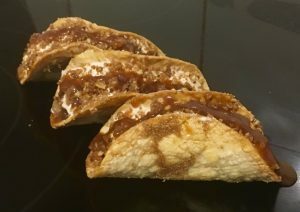 Tags: apple, Apple and Cinnamon Dessert Crumble Taco’s, cinnamon, crumble, tacos	. Posted on July 15, 2017 Posted in Slice	. Apple is a really interesting ingredient to bake with, it is actually quite a difficult ingredient to hero as a key flavor in desserts. 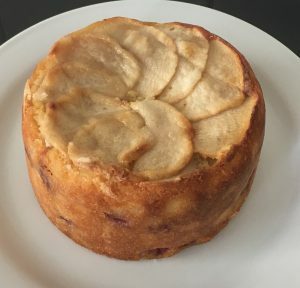 However, as I still have not accomplished a killed apple unusual treat I was determine to succeed in a bake thus hit the kitchen for some experimenting. 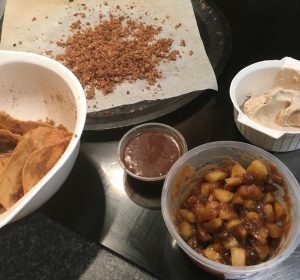 In my experimenting one combo I came up with that I thought would be the winner was the pecan lavender lemon and apple cake, however it was the flavor combo of cinnamon apple peanut oats and caramel that exceeded expectations. 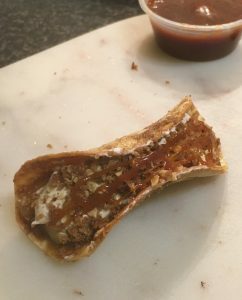 After playing around with this flavor combo with different textures I ended up featuring the nuts oats and spice in a base for a crunch, created a peanut cheesecake for the filling, an apple jelly for an addition textural layer and caramel cream for indulgence. Pre-heat the oven to 180c degrees and line a 30cm x 30cm slice tin with baking paper. 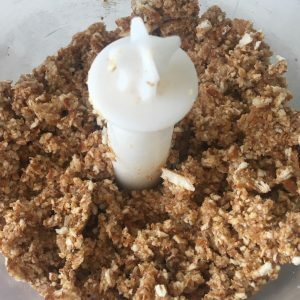 Place all the base ingredients into a food processor and blitz until the mix is combine and balls up on the side of the mixer. Spoon the mix into the cake tin and using the back of a spoon flatten out for even coverage. Bake in the oven for 20 minutes or until the top is slightly golden, leave aside to cool completely. Meanwhile make the cheesecake layer by placing the boiling water with the gelatin and whisking with a fork until dissolved. 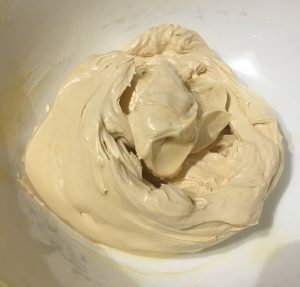 Place the gelatin mix, cream cheese, sugar, vanilla and peanut butter into a bowl and beat with electric beaters until fluffy and well combine. Add the cream to the mix and beat until just combine. Remove the cooled oat base layer and baking paper from the tin and spray the tin with oil spray. Cut 2mm off the base from 2 opposite sides. 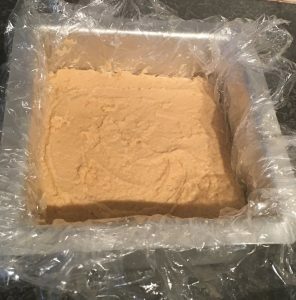 Place 2 sheets of cling wrap over each other with the oat base layer in the center and lift the base back in the tin with the clingwrap overflowing the sides of the tin. Pour the cheesecake mix on top of the oat base layer and even the mix out with a spoon. Place the slice in the fridge for 1 hour to set. 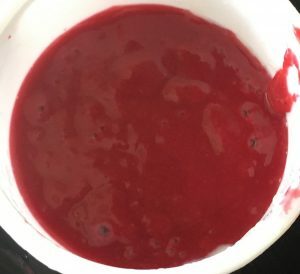 To make the jelly add the freshly squeezed apple juice, sugar and lemon into a bowl and heat in the microwave until hot to touch. Add the gelatin to the apple mix and stir until the gelatin is dissolved, leave aside until cooled completely. Pour the apple mix over the cheesecake layer and leave in the fridge for 4 hours to set. Lastly, beat the cream, cinnamon and sugar until peaks form. Spread the cream over the set jelly layer and leave in the fridge for 1 hour. To serve, pull the cling wrap up to lift the slice from the tin, remove the cling wrap and place the slice on a plate. Tags: apple, Apple Jelly and Peanut Oat Cheesecake Slice, cheesecake, jelly, oates, peanut, Peanutbutter	. Posted on June 3, 2017 Posted in Cakes	. 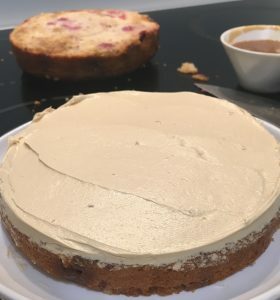 In the past I have made many cake with veggies; a chocolate zucchini cake, spiced carrot cake, traditional Swedish apple cake, pumpkin and maple cake, pumpkin pie…and the list goes on. All of these cakes were sooo tasty and are beautifully moist thanks to the vegetables. 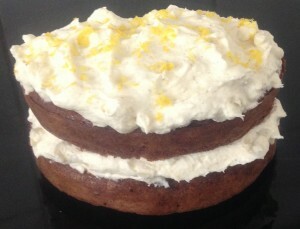 I wanted to take baking with veggies to another level, it may sound weird and bland to have a cake based on a selection of common garden vegetables, however the mix of spices, zingy zest and satisfying inclusion of cream make this cake a unique hearty and nourishing treat. This cake is also a great way to use up left over vegetables and turn them into a scrumptious dessert. Pre-heat the oven to 170c degrees and line a 20cm cake tin with baking paper. In a bowl place the flour, sugar, cinnamon, mixed spice, cardamom and baking powder and stir until combine. 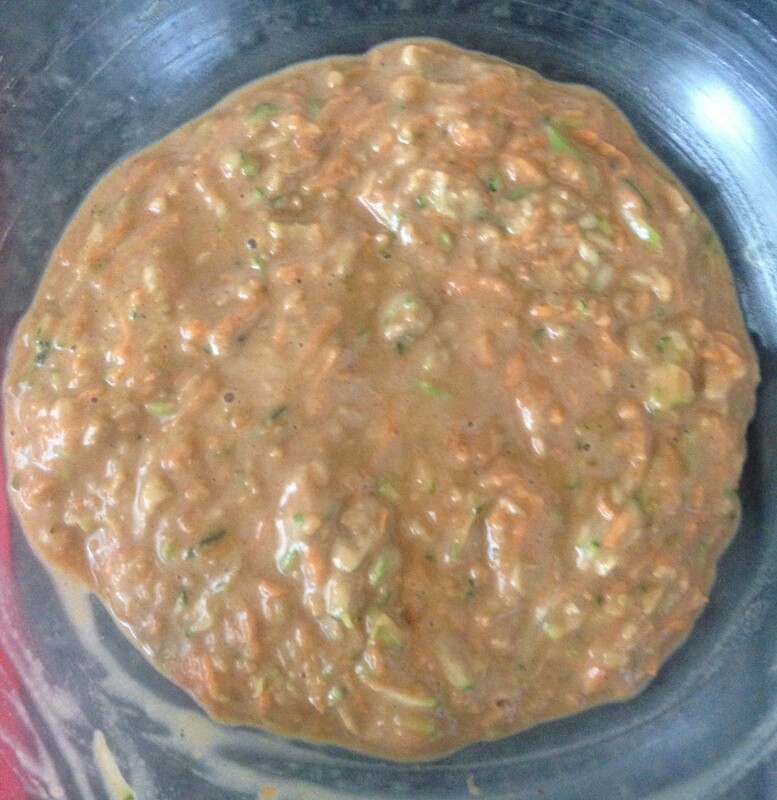 Add the grated apple, carrot, zucchini and pumpkin and stir unit into the dry mix until combine. In a separate bowl mix the zest, milk, oil and eggs. Add the egg mix into the flour mix and stir until well combine. 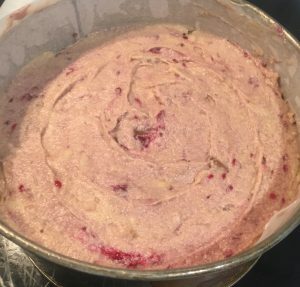 Pour the mix into the tin and bake in the oven for 40 minutes or until a skewer inserted in the middle of the cake comes out clean, leave aside to cool on a cooling rack. 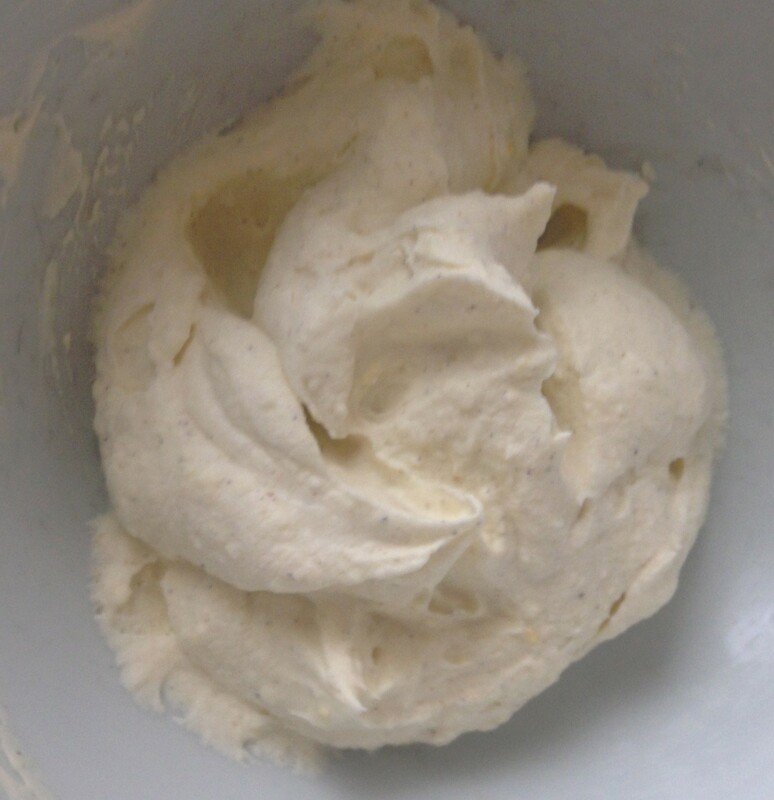 With electric beaters whisk the cream until soft peaks form. Add the sugar, zest and cardamom to the cream and whisk until combine. To assemble cut the cake horizontally in half. Place 1 cake layer on a plate, top with half the cream icing, top with the 2nd cake layer and then with the remaining icing. Tags: apple, Cardamom, carrot, cinnamon, mixed spice, orange, spiced garden cake, Spiced Vegetable Cake, zucchini	. Posted on August 21, 2016 Posted in Pudding	. 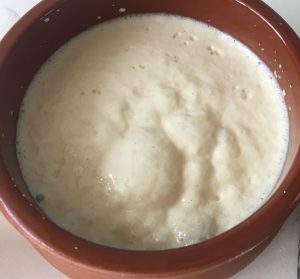 This recipe is a mix between a rice pudding and porridge that can be eaten as a satisfying breakfast or a quick and easy dessert. I eat porridge for breakfast quite frequently and also enjoy a sweet coconut rice pudding for dessert. To my porridge I like to experiment by replacing the oats with similar ingredients such as chia seeds, sago or quinoa flakes. 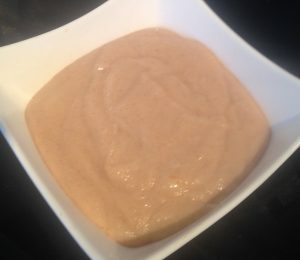 To take my experimenting to the next level I decided to use semolina instead of the oats in porridge or the rice in rice pudding. For the flavouring I opted for apple and cinnamon – an oldie but a goodie. 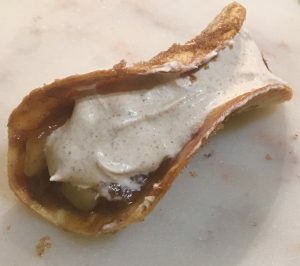 After playing around with the recipe I decided that caramelized apple slices on top of the pudding and beautiful vanilla & cinnamon cooked into the semolina delivered the best taste result. 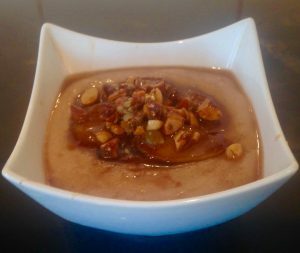 To add more depth I topped the pudding with a burnt honey sauce and roasted nuts for the satisfying crunch texture. 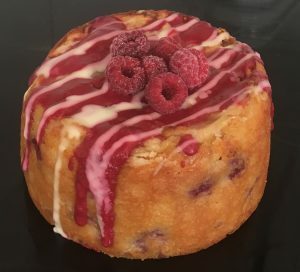 If you’re after a delightful creamy and moreish breakfast option or a sweet way to finish a meal this recipe will have you covered. 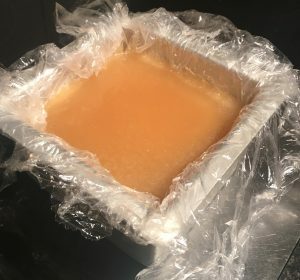 Why this recipe makes the website – the result I ended up with blew my expectations. I could but the spoon down! Place the milk, sugar, cinnamon and vanilla into a saucepan on a high heat. Whisk the mix until it boils. Add in the semolina and butter, stir and reduce the heat down to simmer. Whisk continuously until the milk is soaked up by the semolina and the mix thickens (about 15 minutes). Remove off heat and divide the mix up between 4 bowls. Peel the apples and thick julienne cut them. 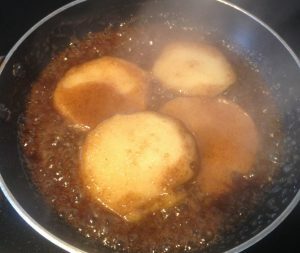 Place the apple in a saucepan on high heat along with the 40g butter, maple syrup and ½ tsn cinnamon. 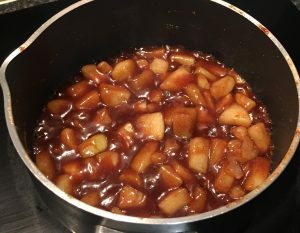 Stir with a spoon until the apples caramelize and are slightly soft. Spoon the apples over the semolina pudding. Place the honey a saucepan on high heat for 1 minute or until it darkens in colour. 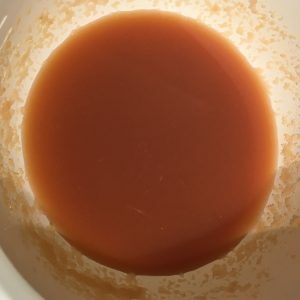 Add the 40g water and stir until the mix slightly reduces and is syrupy in consistency. Spoon the honey over the pudding. Top with finely diced nuts and enjoy. Like this recipe? Please subscribe via RSS or email to get my new entries and more scrumptious recipes with reviews. Tags: apple, burnt honey, cinnamon, Cinnamon Apple and Burnt Honey Semolina Pudding, honey, pudding, Semolina	. Posted on November 16, 2015 Posted in Cakes	. After some recent experimenting with Basil, Earl Gray, Jasmine and Green Tea I’m not surprise that I have also taken an interest in more spice and herb kitchen staples. The latest fixation – Rosemary. 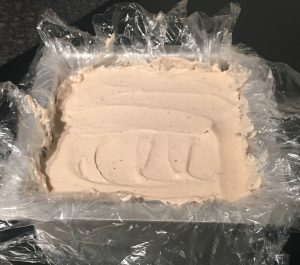 So I went a bit Rosemary baking crazy on the adventure with plenty of trial and error until I finally came up with a recipe that ticked all the box. I was so sure the Chocolate and Rosemary cake experiment would be the strongest, but was triumphed by the Apple Rosemary and Olive Oil Cake. 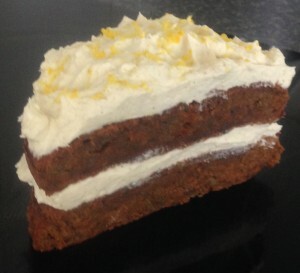 The flavour of this cake is very interesting and addictive with a savory twist. While the apple provides a delectable and delicate texture. Pre-heat the oven to 180c degrees and line a 20cm cake tin with baking paper. 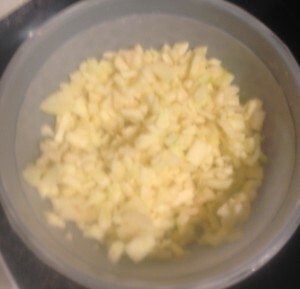 Peel and diced the apple into small pieces and set aside. Place the rosemary into a mortar and pestle and grind until fine. 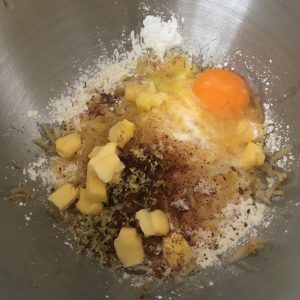 Place the eggs, olive oil, vanilla, ground rosemary and sugar into a bowl and beat with electric whisk for 2 minutes of until the mix is light and fluffy. Sieve in the flours and ground almonds and whisk with a hand whisk until just combine. Add the apple and stir until just combine. Pour the mix into the cake tin and bake for 1 hour or until a skewer inserted into the middle comes out clean. 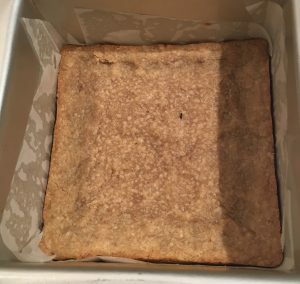 Place the cake onto a cooling rack until cold. To make the apple crisps use a mandolin to finely slice the apple and place in a saucepan on a medium heat with the sugar and butter. 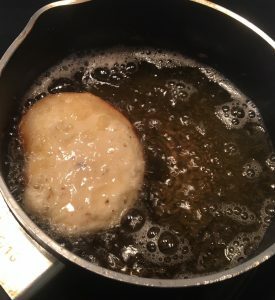 Stir until the butter and sugar mix is soaked into the apple, then place the apple onto baking paper and place in the oven for 10 minutes or until the apple begins to golden. Remove the apples and set aside to cool. 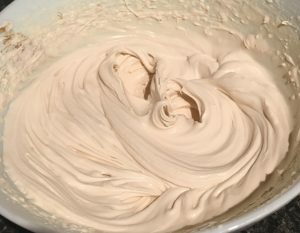 To make the icing place the mascarpone, vanilla and honey into a bowl and using electric beaters whisk until peaks form. Cut the cake in half horizontally and spread with half the cheese mix. 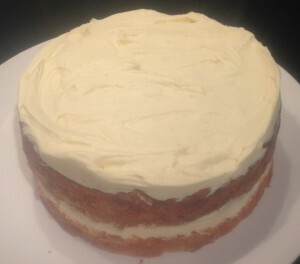 Place the 2nd cake layer on the top of the cheese icing layer and top with the remaining cheese. Scatter the apple crisps over the top of the cake and enjoy. 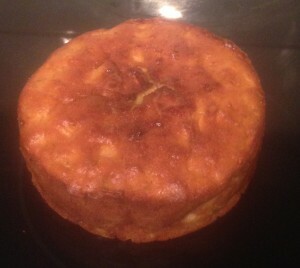 Tags: apple, olive oil, rosemary, Rosemary Apple and Olive Oil Cake	. Posted on June 22, 2014 Posted in Unique	. 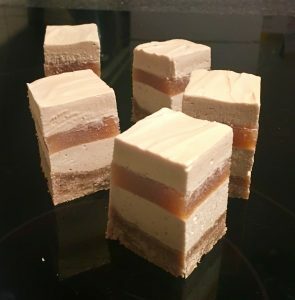 So by now you would notice that I frequently experiment with vegetables in sweet baking, love to make traditional unique world treats and play with textures. However, lately I have really started to take an interest in turning ‘traditional’ savoury meals into sweet alternatives. 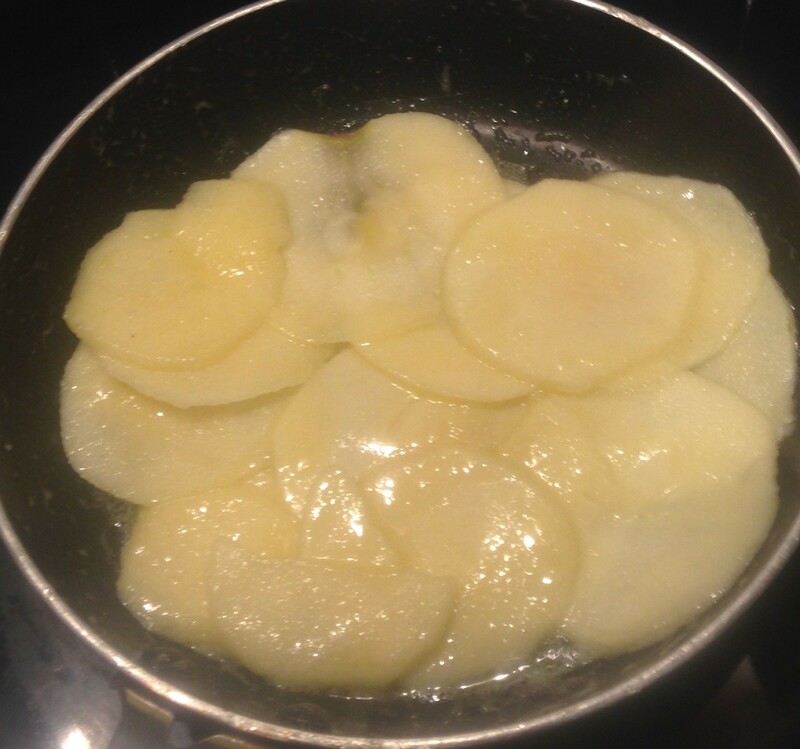 Based on this new found curiosity I decided to experiment with a very well known easy dish that is properly one of the most popular meals around the world….Maybe this wasn’t the smarted thing to play with every households family favourite food, but I think if you try this recipe you will let my off the hook as its that good! 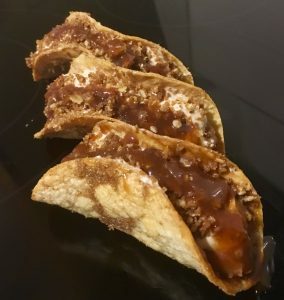 Now this recipe does have quite a few parts (5 in fact), but each part is super easy using pretty much the same ingredients so please don’t be turned off by this, especially since 2 of the parts take between 2-5 minutes to do! 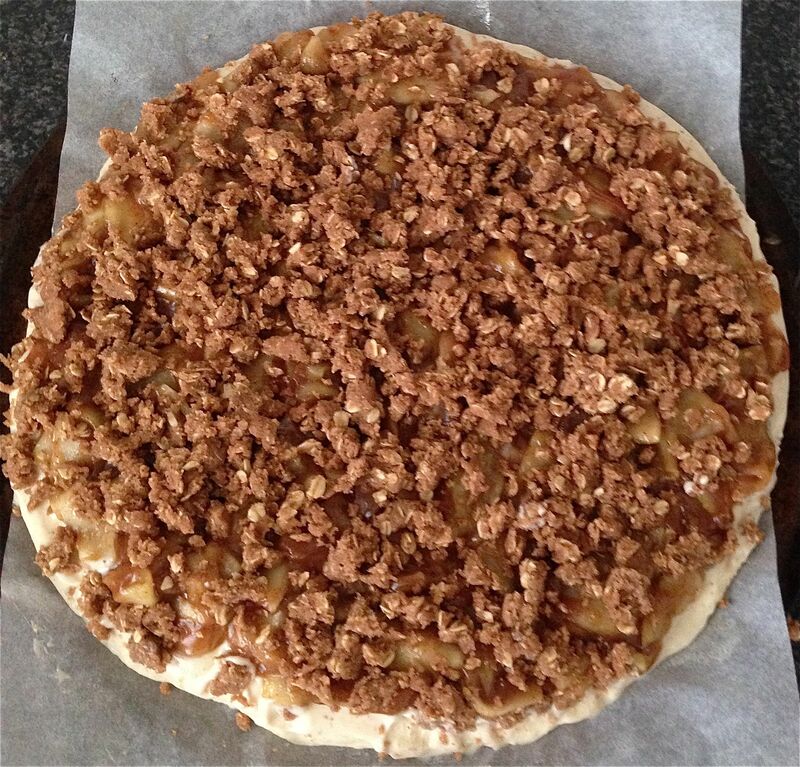 So if you’re a fan of pizza and have a soft spot to a warm winter apple crumble…humm you will LOVE my Apple Crumble Pizza! 1. 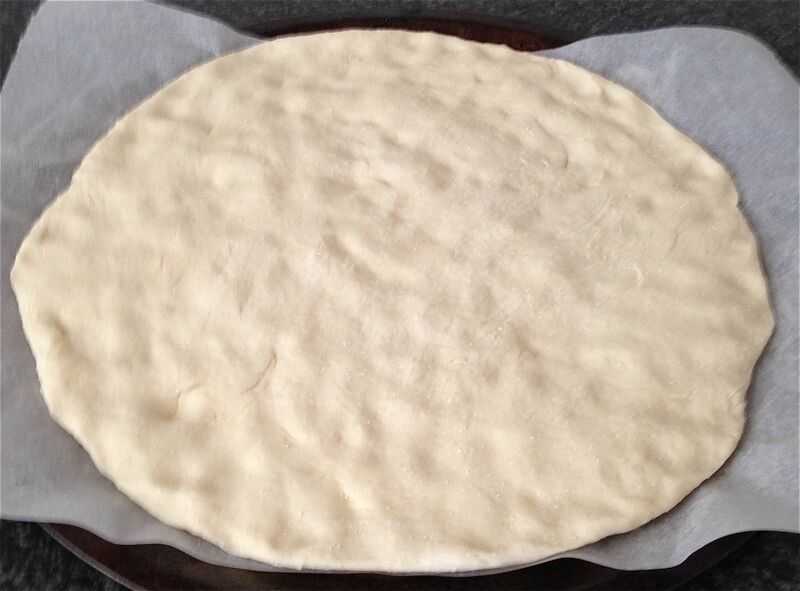 Preheat oven to 190c and line a 16-inch pizza tray with baking paper. 2. 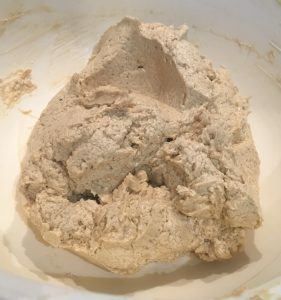 Pour flour and yeast into a large bowl, stir. 3. Add the water, salt, sugar and oil into the dry mix. 5. 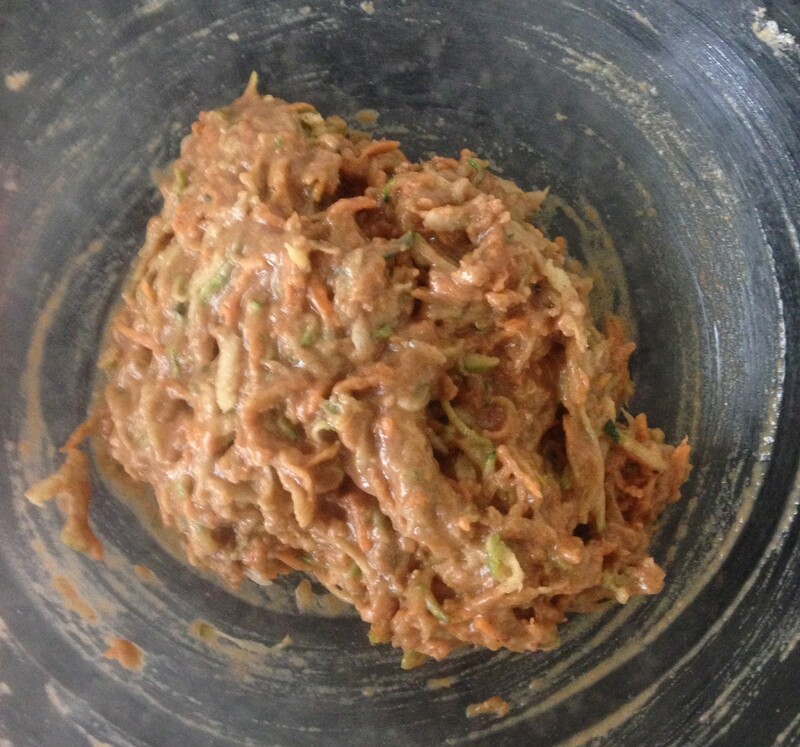 Add cheese spread ingredients into a bowl and whisk until well combined. 6. 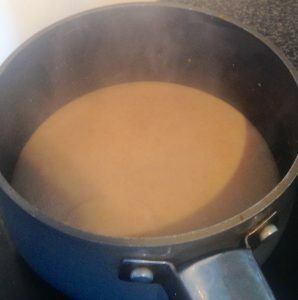 Place the flour, sugar and cinnamon into a medium sizes saucepan, stir until sugar is dissolved. 7. 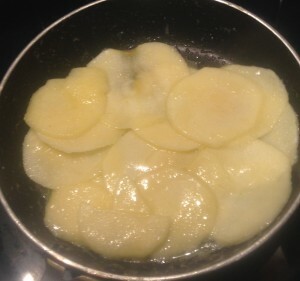 Add the butter and apple and turn the hotplates to medium, stirring constantly. 8. Once mix comes to the boil turn to low and continue to mix until the apples are tender. 9. Place all ingredients into a bowl and with hands rub to combined. 10. 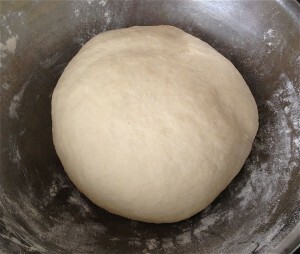 Place dough onto the tray, punching down dough to make a large circular base. 11. Spread the cheese spread with the back of a spoon to evenly distribute. 12. Evenly place apple mix onto the spread layer. 13. Sprinkle the crumbling topping over the apple mix evenly. 14. 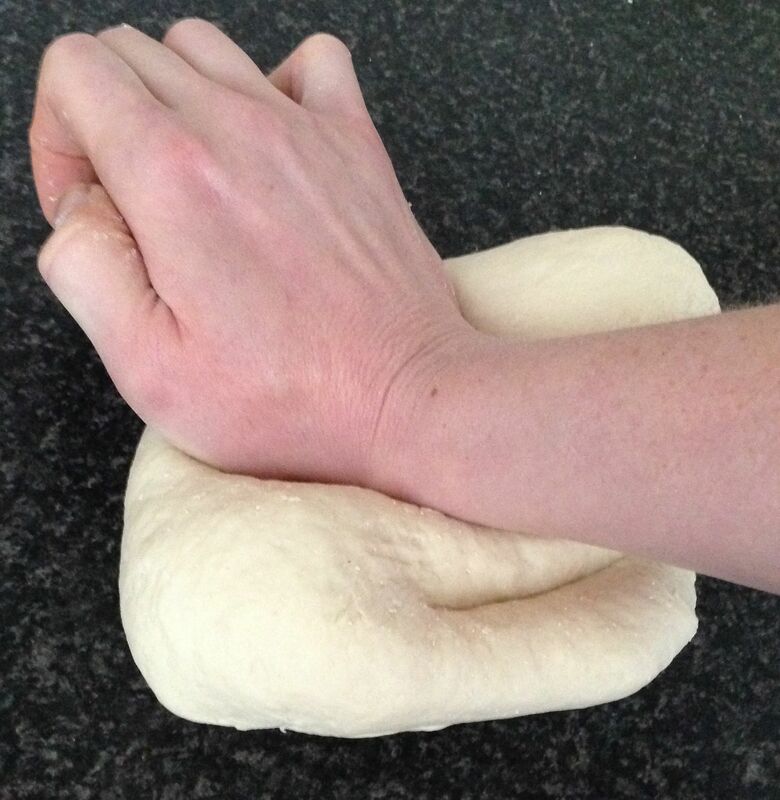 Cover the pizza for 15 minutes in a warm place with a tea towel on the top. 15. Place the pizza in the oven for 25-30minutes or until browned and golden. 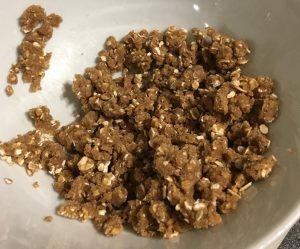 Brown sugar is not essential if you have none just use white sugar. If you don’t like nutmeg again this is not essential so you can omit this, but to be honest you wont taste the ingredient it just enhances the others flavours. This recipe does make a MASSIVE pizza. 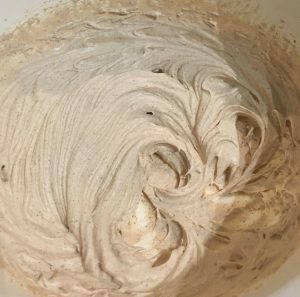 It is very easy to half the mix if you don’t have an army to baking for 🙂 (you will notice this from the step pictures). I recommend using a mandolin to get quick and easy apple slices and granny smith apple as they hold their shape quite well when you cook them. 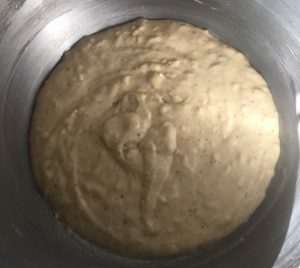 Make sure you punch the dough down well and spread evenly as the dough will rise quite a bit and you don’t want it really thick in the centre but thin on the outsides. Slicing the apple. 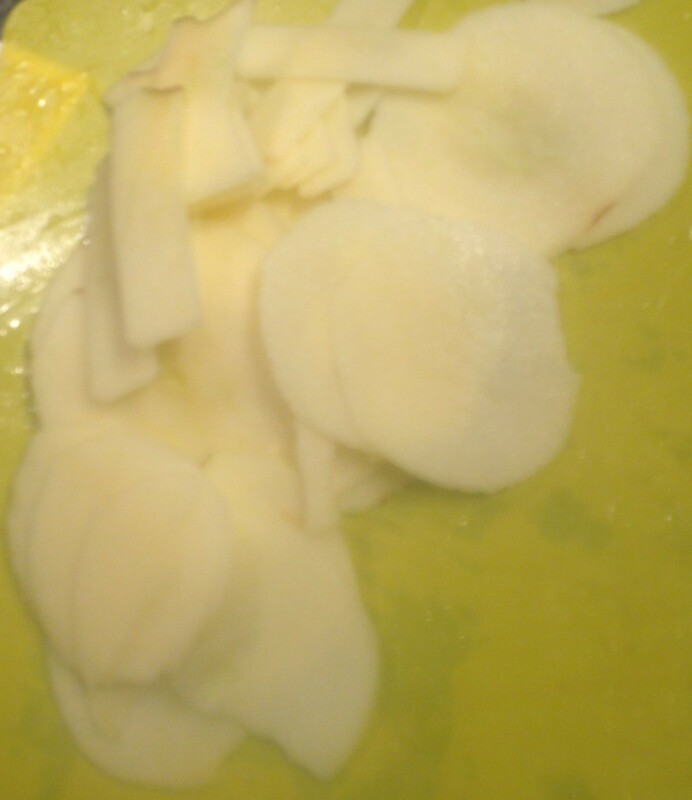 Use gloves and vegetable holder when slicing. 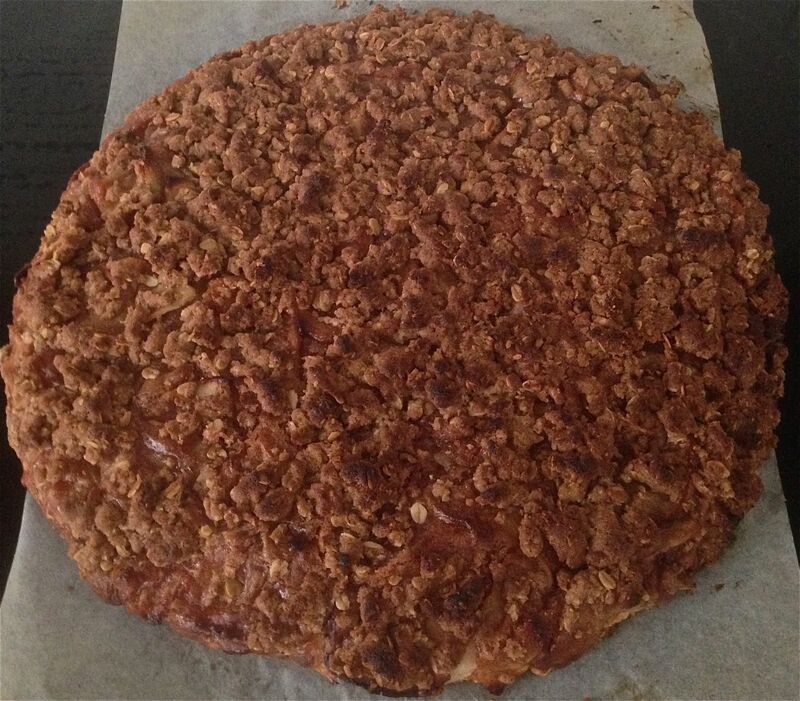 Tags: apple, apple crumble, apple crumble pizza, cream cheese, crumble, pizza	.